AUT is crafting the next generation of business leaders who are ready to solve some of the world’s biggest challenges, says Lucy Conyngham. “I would definitely recommend the AUT business degree as it not only teaches you the latest business knowledge through a collaborative and hands-on approach, but also opens your mind to the endless possibilities business offers. I loved being challenged every day and getting the opportunity to constantly grow. For her final-year workplace experience, she moved to London to intern at Worth Capital, a venture capital firm pioneering the largest seed funding competition for start-up businesses and entrepreneurs in the UK. “While I was mainly supporting their marketing efforts, I also got to be involved with the judging process of these monthly competitions along with the co-founders. That meant I was exposed to hundreds of applicants and got to follow the early stages of some of the UK’s most promising start-ups. 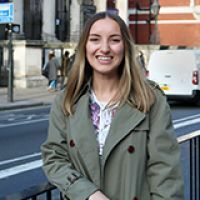 After completing her workplace experience, Lucy decided to remain in London and is now working as the sales and marketing coordinator for CoGo – Connecting Good, which connects consumers with businesses that care about the good of people and the planet. “Make the most of your time at university, Lucy advises other students. “Uni is an incredible place full of endless recourses, people to network with, lecturers to gain wisdom from and activities to get involved in. It’s your chance to decide how much you put into it, which will dictate how much you get out of it. Don’t worry if you’re still unsure what you want to do, she adds.